Typically, I don't get overly technical on my blog which I can, so I am going to get a little nerdy now. For my exterior architectural renderings, I use V-Ray from Chaos Group and I have nothing but good things to say about the software and developers. Although no software is perfect, V-Ray is dang near close. 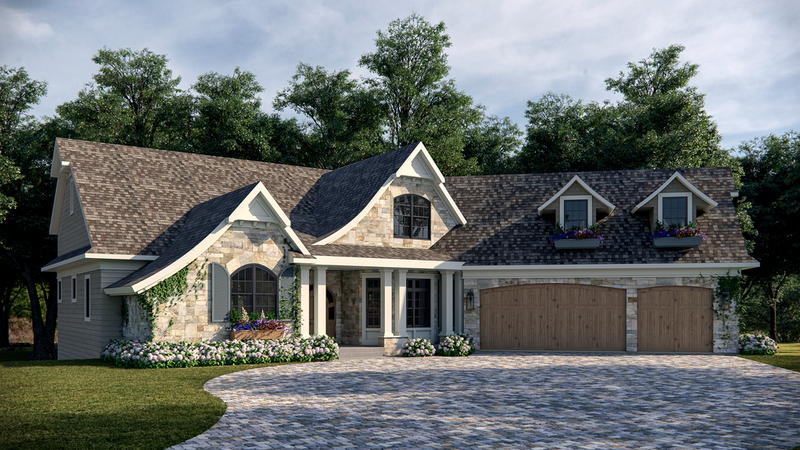 The Bohland Residential Exterior Rendering has all the bells and whistles with a ton of displacement, trees, bushes, grass, and rendered out at 5k resolution. Without having to hold back or spend hours optimizing the Bohland Residential Exterior Rendering rendered in less than two hours, which is remarkable. Since I will be asked, here are my computer specs. I don't have a large render farm and The Bohland Residential Exterior Rendering was rendered in less than two hours on my single workstation, which although is a beast; the render time is amazingly fast. At one point I had a ten workstation render farm, but I was spending far too much time being an I.T. guy and not being a creative guy. Basically, I stuffed those ten workstations into the one and I now can spend my days creating architectural renderings like The Bohland Residential Exterior Rendering. Other software used to create The Bohland Residential Exterior Rendering are the following.